When Billy Caldwell’s medicinal cannabis oil was recently seized at Heathrow Airport, the drug was put back in the spotlight. Reading’s Professor Gary Stephens investigates the effects of cannabis-derived compounds on the brain. Here he gives update on the research, why it’s needed and how long it will be before new drugs will reach patients in a new post for The Conversation. 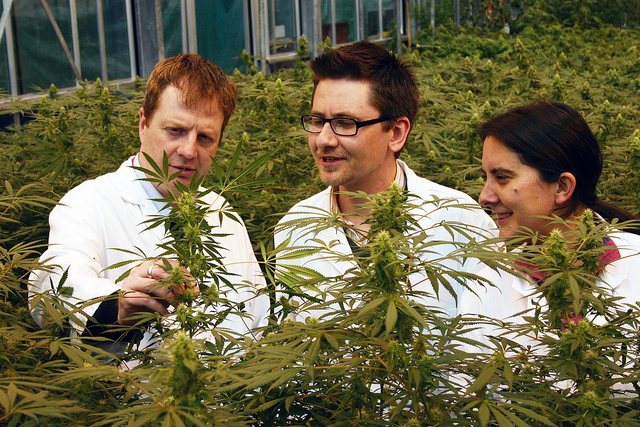 Gary Stephens with University of Reading colleagues Dr Ben Whalley and Dr Claire Williams, pictured at a Cannabis-growing site in 2011. One of those people is 12-year-old Billy Caldwell. Billy was in the news recently after the cannabis oil prescribed for him was confiscated at Heathrow airport by the authorities. Billy’s mother, Charlotte, was attempting to bring the cannabis oil into the UK from Canada, where cannabis oil is legal. Billy was seizure-free for more than 250 days when taking the oil, but his seizures started again when his cannabis oil was withdrawn. The home secretary, Sajid Javid, was persuaded to intervene and one of the seven bottles of cannabis oil was returned, with a 20-day licence to administer the medicine. In a similar case, six-year-old Alfie Dingle, who suffers from severe epilepsy, had been successful treated with cannabis oil in the Netherlands. Alfie’s mother, Hannah Deacon, has been campaigning to allow her son to be provided with cannabis oil in the UK. The government has now also relented in Alfie’s case following the concerns raised around the confiscation and return of Billy Caldwell’s medicine. So what do we know about cannabis oil and its effects on epilepsy seizures? The two main constituents of cannabis oil are THC (tetrahydrocannabinol) and CBD (cannabidiol). Oil containing CBD alone (CBD oil) can be legally bought in the UK without a prescription because it contains only very low quantities of THC. But cannabis oil that contains THC at higher levels (more than 0.3%) is illegal. THC is a schedule 1 drug, that is to say, it is deemed to have no medicinal value. The reason that Billy’s cannabis oil was seized at Heathrow airport was that it didn’t just contain CBD, it also contained THC at higher levels than legally permitted. There is good evidence in robust human clinical trials that CBD is of benefit for specific epilepsies, such as Dravet syndrome and Lennox Gastaut syndrome. An advantage for the pharmaceutical industry is that these rare diseases with no cure can be fast-tracked for drug development. On this basis, the US Food and Drug Administration is widely expected to grant a licence for CBD (under the tradename Epidiolex) to treat these epilepsies. If so, Epidiolex is likely to be available in US by late 2018. European approval is likely to follow. It should be noted that Epidiolex is designed as standardised oral solution of pure plant-derived CBD. It is not the same as the non-standardised, viscous CBD oils that contain varying amounts of CBD and can be purchased in health food shops. There is currently no good evidence that formulations of CBD oil (or indeed cannabis oil) are as effective on epilepsy seizures. Equally, there is no robust evidence – just anecdotal reports – that THC helps reduce epilepsy seizures human. In [animal studies], THC has weak overall effects in reducing seizures and has also been shown to be a less effective anticonvulsant than CBD. THC, being a psychoactive substance, also has a number of side effects, including the well-known euphoric “high” associated with recreational use – which is a significant disincentive for the pharmaceutical industry to develop a medicine containing this compound. We now need to decide if we should expand human trials with better defined THC-containing cannabis oil, or if we should focus on CBD. The fact that Epidiolex has progressed towards approval in the US may encourage the latter course. CBD lacks psychoactive effects associated with THC and, in general, is regarded as a safe compound. If Epidiolex is granted regulatory approval, it will also need to be monitored in a larger number of patients – in what’s known as “phase 4 post-marketing surveillance” – to ensure that it is safe and effective in a broader population. For any cannabis-based product, only large-scale clinical trials can provide definitive answers about effectiveness and safety.